I’m so thankful to have such a great group of mom friends at my son’s school. We hit it off when James started Pre-K3 and he’s in third grade now, so we’ve all really gotten to know each other over the years. About a year ago or so, we put together a Bunco group so that we’d have a standing monthly date on the calendar to get together. You know how it is, unless it’s on the calendar, it’s probably not gonna happen! If you don’t know, Bunco is an easy to play dice game, but really, it’s a chance for a girls night out sans kids and men with lots of wine! We alternate who hosts and that person serves a main dish and everyone else brings sides and drinks. I’ve been introduced to lots of delicious food at these Bunco nights, and my friend Jamie’s white chicken chili was a stand out! It was so good that of course I begged her for the recipe and went home and made it the next day. Not surprisingly, it was a hit at my house too and the best part is, you can make it in your slow cooker! 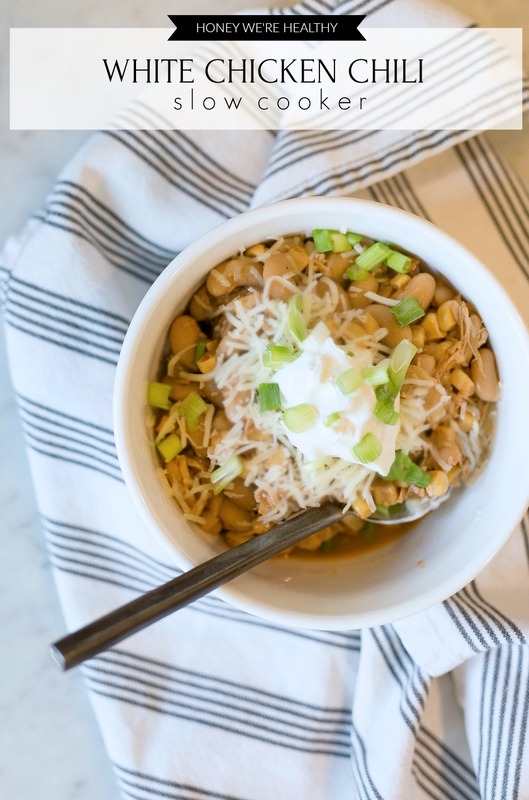 With kids heading back to school and Fall almost here, this delicious, easy white chicken chili recipe will be great to have on hand for busy days! 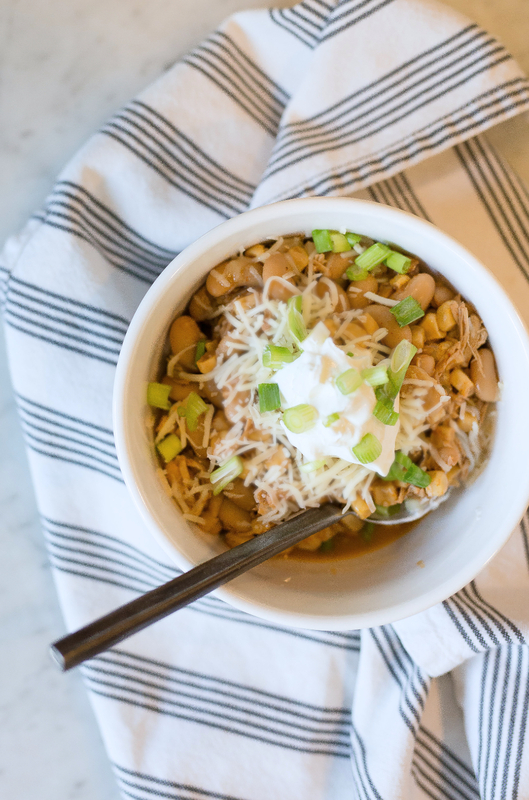 This is a simple slow cooker dish with a different spin on a traditional chili because it’s made with healthy chicken breast and white beans. Definitely garnish your chili with some of these toppings (avocado, sour cream, cheese, green onions, and/or a squeeze of lime) to take it to the next level! The awesome thing about a slow cooker meal is the obvious. You just dump all the ingredients into the pot in the morning, and you have a delicious, piping hot meal ready to go by dinner time. There’s minimal clean up and you didn’t have to spend a lot of time slaving over a hot stove. I have done this with both cooked and uncooked chicken. We had a rotisserie chicken on-hand this time around so we used that! 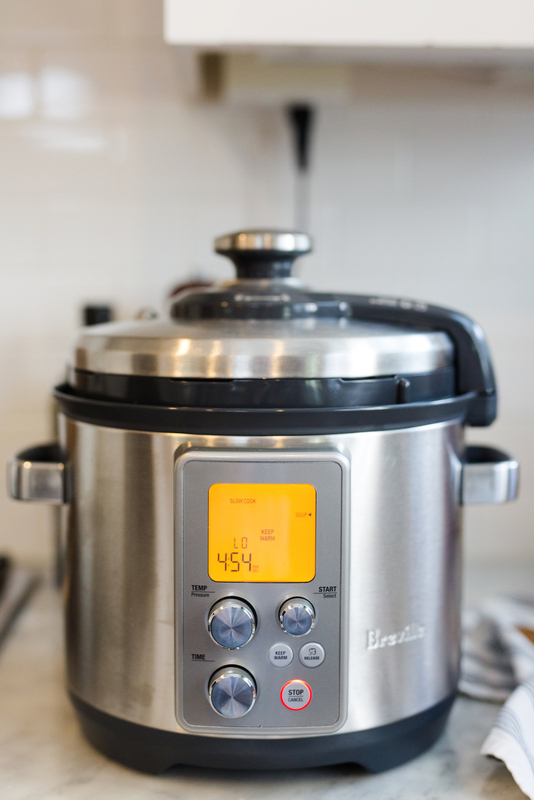 You can use a traditional crock pot or Instant Pot to make this dish, but my husband upped our slow cooker game by investing in the Breville Fast/Slow Pro Cooker. 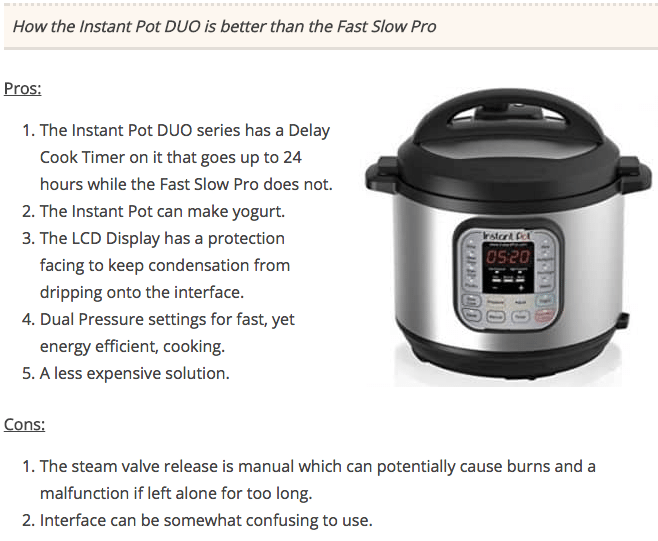 If you’re trying to decide between the Instant Pot or the Breville Fast/Slow Pro Cooker, I found this review to be the most helpful in comparing them. My hubby wanted what he considered to be the ‘best of the best’ and he preferred the LCD display, so that’s the one we went with. 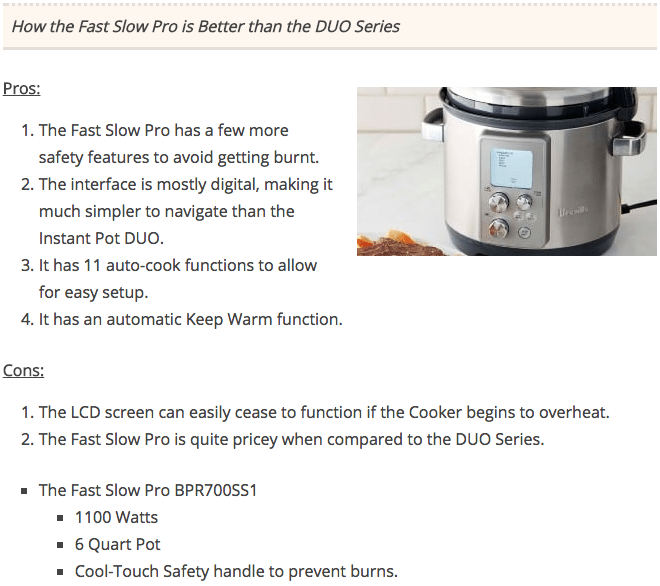 I do actually really like the easy-to read display as well and how easy it is to just turn the dial to customize the Fast/Slow Pro to what you are cooking. It’s also super easy to clean because the inner pot comes out and you can wash it in the sink. 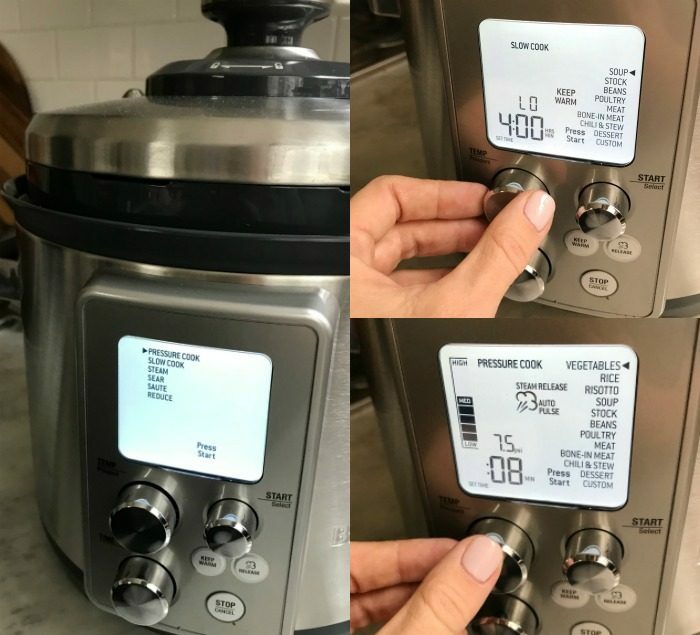 Several of my friends have the Instant Pot and are happy with it, so if it comes down to cost, the Instant Pot is less expensive. Both of them are on eBay in their end of season sale. I’ve talked about eBay before but as a friendly reminder, it’s not all auctions like you might remember from the old days. 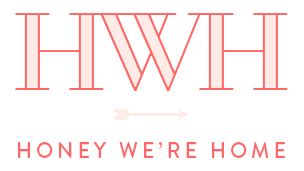 In fact, over 80% of their items are “buy it now” which is what I always shop. I hate to wait! And they have millions of ‘New With Tags’ items – things that are brand new, never been used or worn, many with free or expedited shipping. I always check the reviews to ensure that seller has a good reputation, but you can shop with confidence because eBay has a money back guarantee if you change your mind. 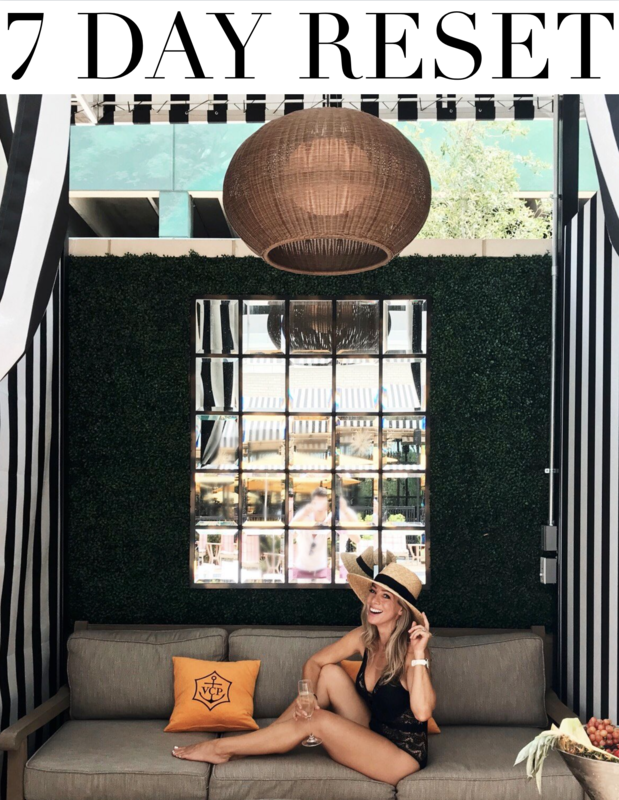 If you spent the summer wearing out your patio set or coveting your neighbor’s really cool pool toys, now is the time to stock up for next summer!! 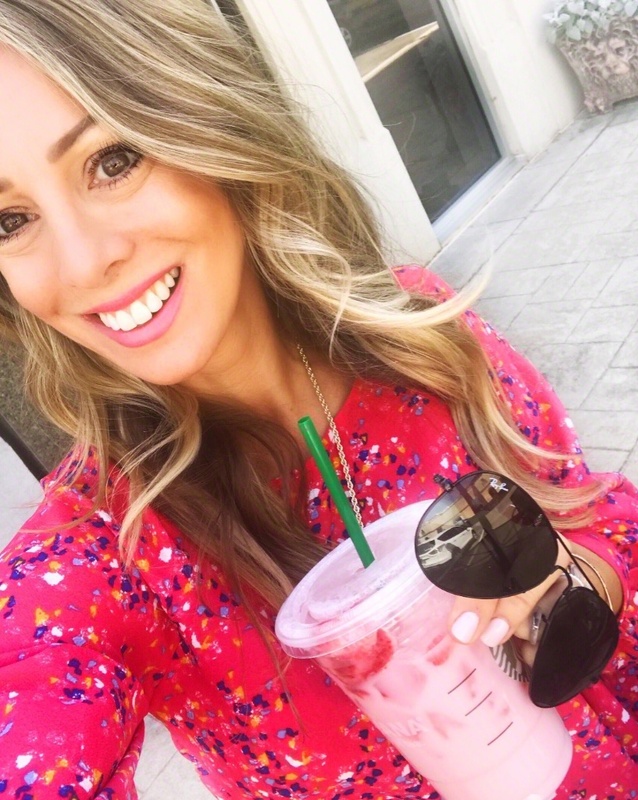 There’s also cute clothes for those of us expecting warm temperatures well into October and some cool weather outdoor essentials as well! After 8 – 10 hours of being productive while your chili cooks, garnish with some of these toppings (avocado, sour cream, cheese, green onions, and/or a squeeze of lime) to take it to the next level! Enjoy! 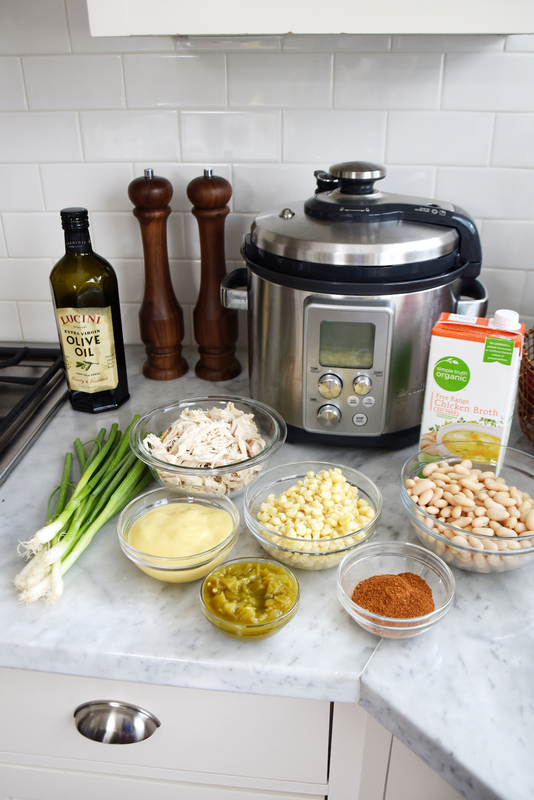 If you’d like to print a copy of this recipe for your recipe binder, you can do so here: Crockpot White Chicken Chili. Thank you to eBay for sponsoring today’s post! 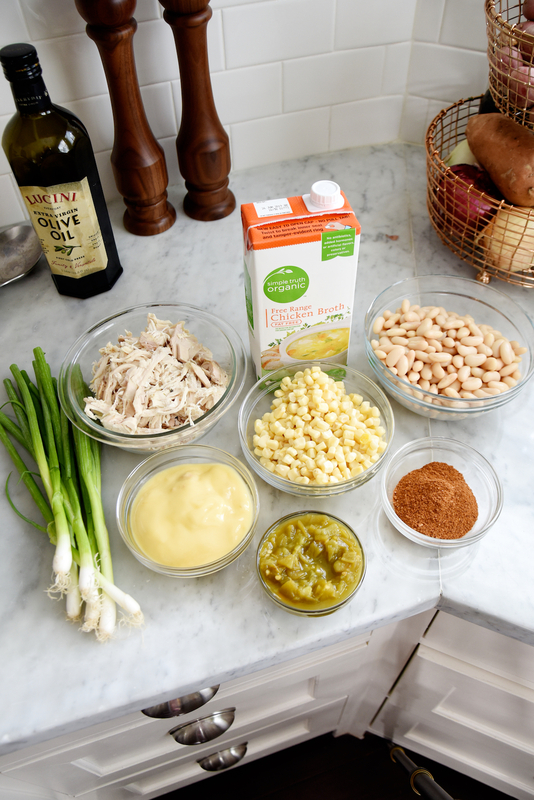 Let me know if you end up making this easy white chicken chili recipe and how it turned out! Have a great day friends! I just purchased an Instant Pot yesterday. My son and I cooked frozen chicken in 25 minutes. He picked salsa chicken over rice and beans but we will have to try this out soon. I will be using this a lot now that football, tutoring and guitar practice has me running 3 days a week. I see you made this with cooked chicken. I’m assuming you could use uncooked chicken right? Hi Emily! Yes, you could use either! I’ve done it both ways in the past! Hi Megan! 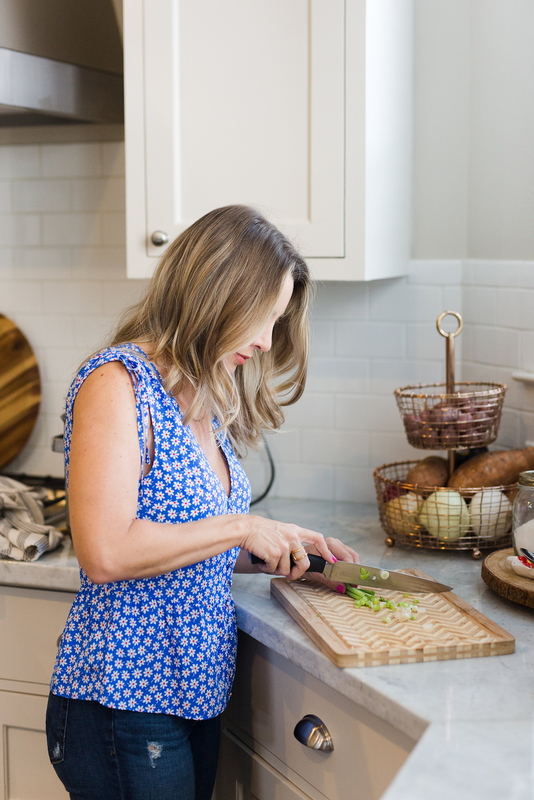 Is your chicken precooked? Also, did you use rotisserie chicken? Thanks! Thanks for this recipe! I can’t wait to give it a try! My kids are heading back to school after Labor Day, and that means lots of after school activities. 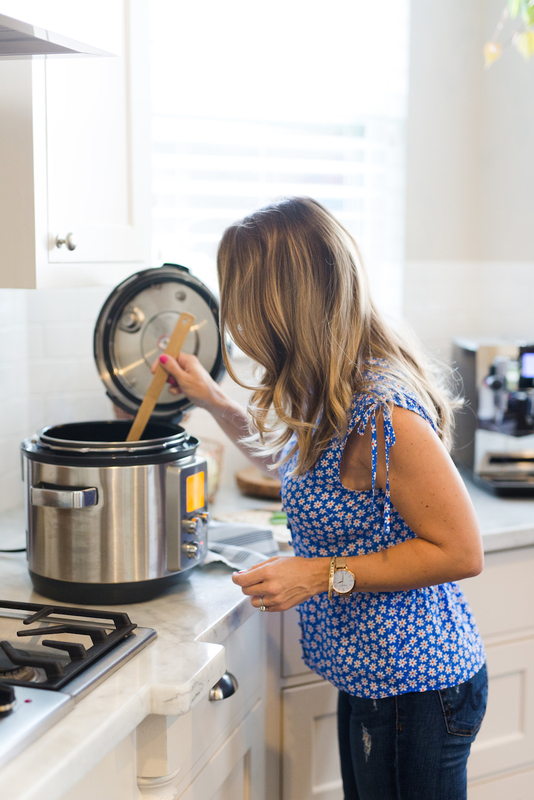 The crock pot is such a lifesaver for me, and I have been trying to stockpile some new recipes. Thank for sharing Megan, It seems such a great recipe, yum. I am definitely going to make this on this weekend as I have been lazy in these days and don’t want to cook anything. I love your kitchen as well. Thank you for sharing . I Luv Chilli. I’m looking forward to making it. I love simple & fast meals . I have a very busy schedule in my life with my son in school and running a business. Looks like a yummy dish. 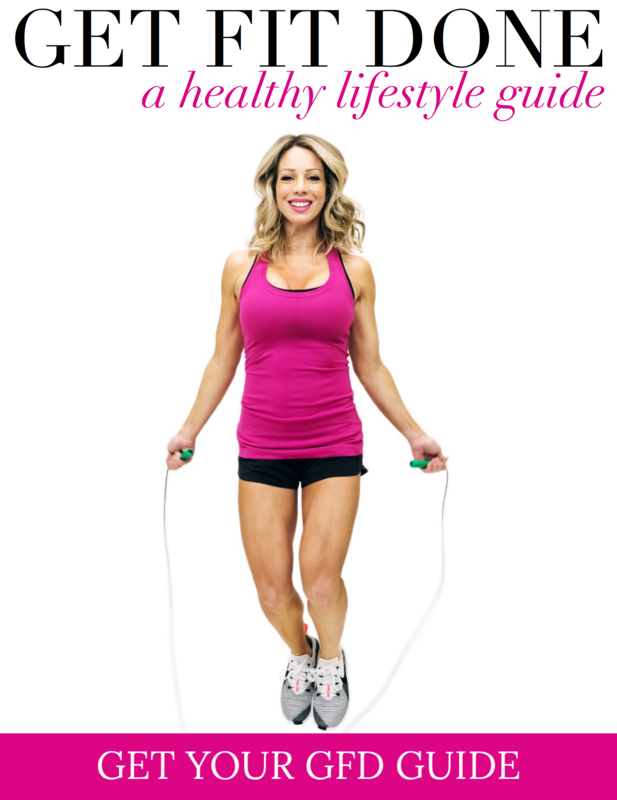 Could you include the nutritional breakout with your recipes? It would be greatly appreciated. Oh good idea, thank you! Can you use frozen chicken for the crock pot or do you suggest thawed only? Hi Shanna! Hmm, I’ve used raw but not frozen so I’m not sure. My husband & I are expecting our first baby (a little boy!) 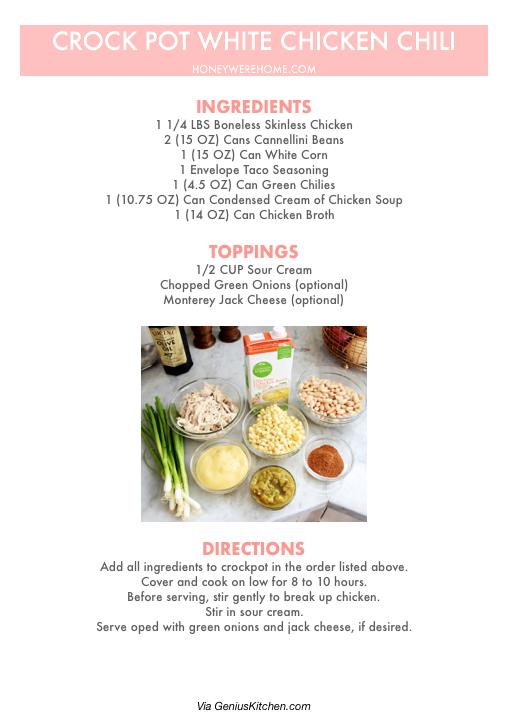 any day now, so I’ve been trying to stock our fridge & pantry with ingredients to make easy crockpot meals just like this one. This is definitely something I see me throwing in the crockpot in the future! Oh girl, I’m so so excited for you and your family! I hope you are feeling great!! I’m so happy to hear that! 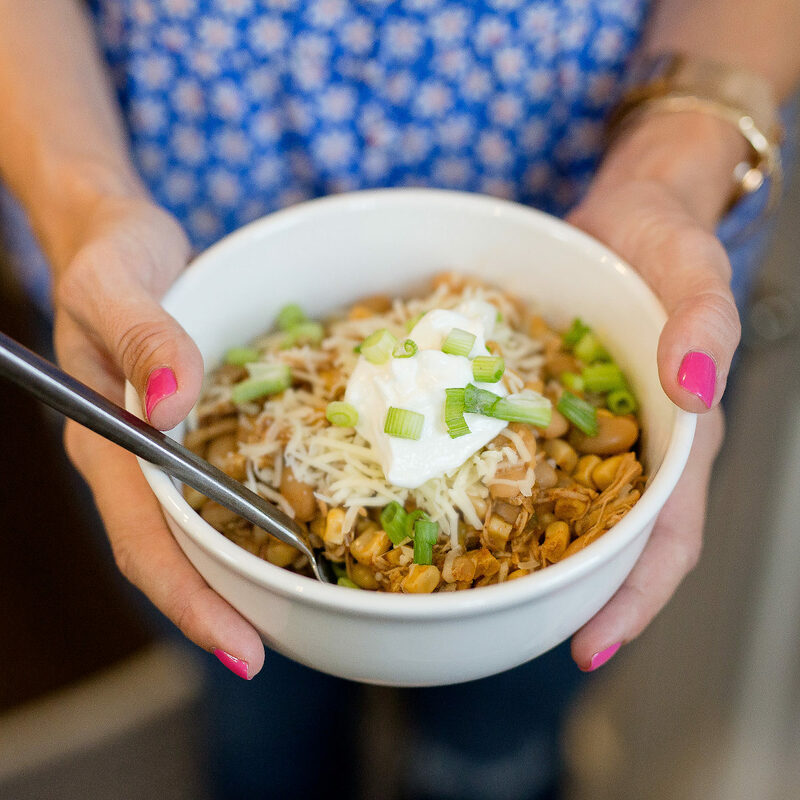 Those slow cooker dishes are a lifesaver sometimes! It looks very tasty. Thanks for sharing the recipe.